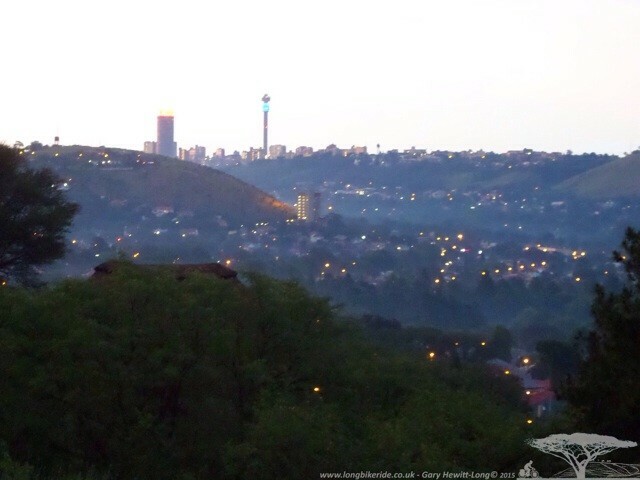 No one told me Johannesburg is so hilly. Starting several miles out the hills start, combined with high temperatures made for a tiring ride into the largest city in South Africa, also referred to as Joburg or Jozi, home to around 13 million people. As I neared the Golf club where I was due to meet Chris, introduced to me through a mutual friend Peter the clouds started to gather, the winds increased… against me (is there no other way?). I finally arrived at the club house and I was going to be in Johannesburg for Christmas. I wasn’t in a set of clothes that befitted the golf club environment, more like a cycling tramp. I was surprised the guys at the security gate let me in so easily, I wouldn’t have let myself in! After being greeted at the club, Chris immediately got onto a most important task, ensuring I was well hydrated… with beer. Sampling several of South African Breweries beers before we returned to Chris’ house where I was introduced to his lovely wife Brenda. The following morning after a good night’s sleep I was picked up for breakfast by Dean, a contact from my working days, a supplier to the company I worked for. 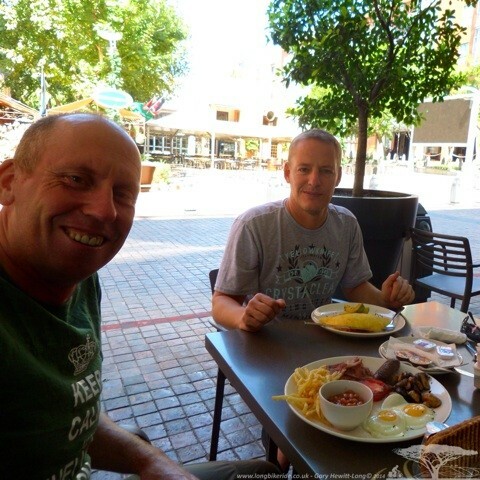 After having worked with Dean for over 6 years by email it was good to finally put a face to the name and we enjoyed a hearty breakfast, sat outside with beautiful sunshine illuminating the plethora of shops around. Christmas Eve was spent with Chris’ family whose house had a wonderful view over parts of the city from high up on Highland Road. I was made most welcome and we had a lovely evening chatting over a good meal and a few drinks. The weather being unpredictable had caused Chris’ sister Jennifer a few problems shortly before we arrived, their house had been struck by lightning… twice and the heavy rains had converted the swimming pool into a different kind of water feature, cascading water over the sides, down the garden and toward the house! Christmas Day was relaxed in the morning, spent quietly at home where Chris and Brenda had given me a lovely t-shirt with the South African flag on it and lunch was with Chris’s son’s family in Pretoria where we had a salad for lunch, the perfect meal for the high temperatures. The first time I have spent Christmas out of England, the contrast in temperatures a little odd. Wandering through places earlier in the week is an experience, songs singing about snow, people wearing Christmas hats and the temperatures are exceeding 30 degrees Celsius. 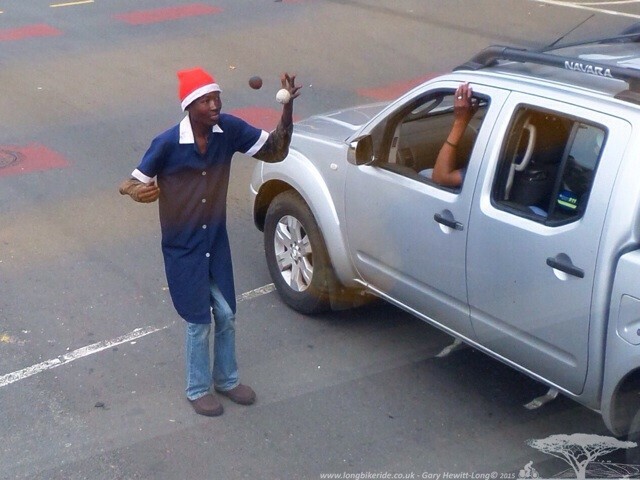 Boxing day, time to see some of Johannesburg, I was dropped off at the bus station where the red top open tour buses depart. Not normally one for taking these types of tours it does take away the hassle of working your way around a city you don’t know and there is a good commentary to explain about the city. The city was quiet as a lot of the residents had left for the Christmas period to go to other places, Cape Town being a popular Christmas destination. As the bus drove through the near deserted city, there were still some people about. 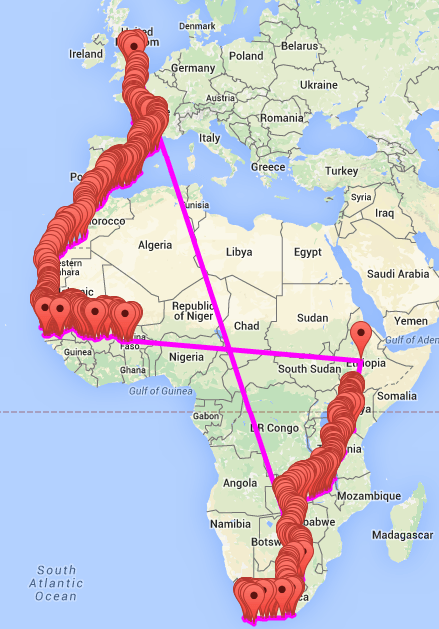 The tour took in for an extra charge a trip to Soweto. 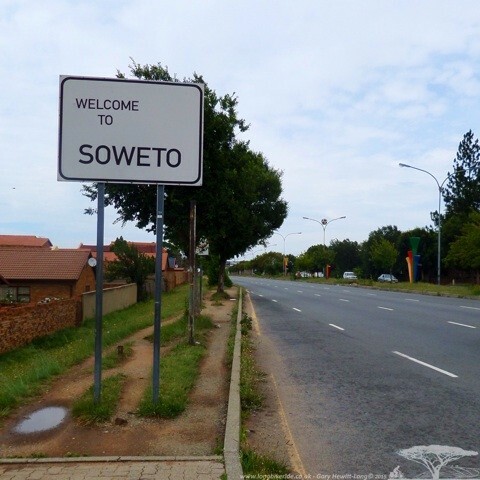 Soweto so often heard about as I grew up in the UK, on the news regularly for violence and problems arising from the apartheid era. Soweto was not as I expected it to be. The guide explained that the Township had lots of brick built houses which it had always had, there were also unplanned tinned shacks, but mainly the houses were all self contained with a small garden, water supplied through communal taps. I had expected the place to more downbeat like some of the places I had already ridden through in other countries, but it was relatively clean and nice. 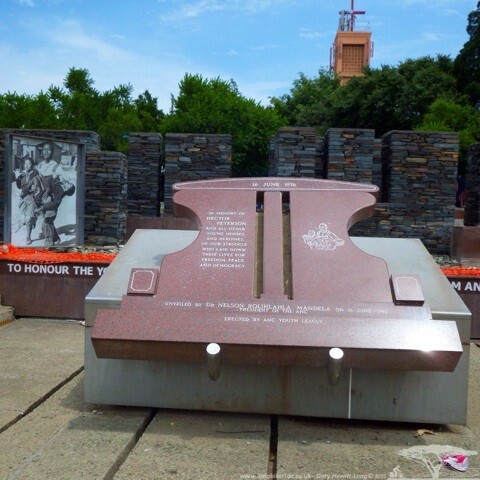 Soweto is also home to the Hector Pieterson memorial, shot in 1976 during the Soweto Soweto Uprising. Whilst I was stopped with Chris and Brenda I started to feel ill, fever at night, headache and oddly I had a pain in the ball of my foot. A day or two later I noticed there was a black mark in between my toes and some swelling. Looking closer it looked like some sort of bite and as I was feeling quite poorly Chris took me to the doctors where I had another Malaria test and was given a prescription for Augmentin, some cortisone cream and was told to take the Doxycycline I already had. It looked like I had African Tick Bite Fever. The symptoms much like flu but not quite so bad. I had a continual headache for several days that simply wouldn’t shift and spend two days in bed not doing a lot. Luckily I was stopped somewhere nice and was looked after well by Chris and Brenda whilst I convalesced. I am very grateful for being carted around to the doctors and being looked after. 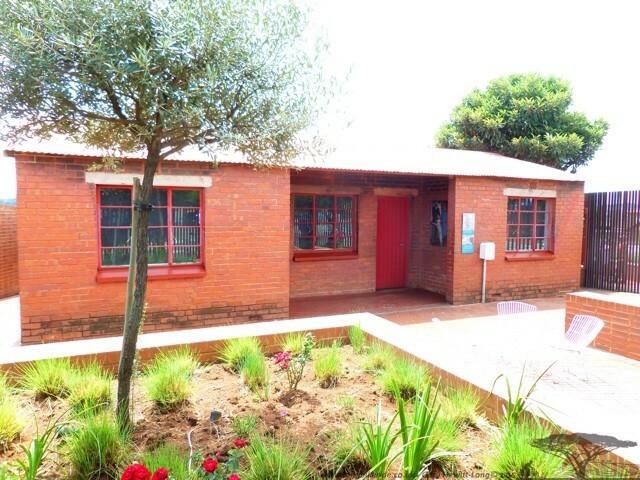 Nelson Mandela spent many years in Orlando, Soweto where his old home is now a tourist attraction. Happens to be closed over the Christmas period. 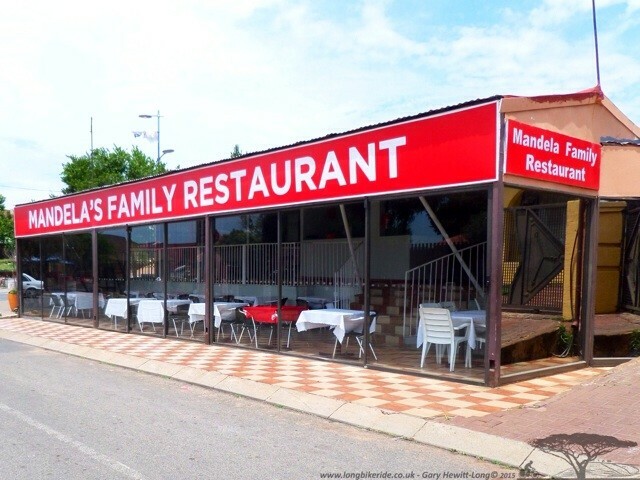 Opposite Nelson Mandela House is a restaurant which is still owned and managed by his ex wife Winnie. Chris was set to play golf at the Gary Player golf course in Sun City over the holidays. Sun City is a luxury casino and resort which lies next to the Pilanesberg, a national park which contains a lot of wildlife. Whilst Chris whacked small white balls around a spectacular golf course, Brenda and I drove into the Pilanesberg to take in some wildlife. Lots of Wildebeest, hippos, Zebra, warthogs and many other animals including the Springbok, the national symbol of South Africa. 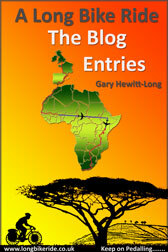 After Soweto I visited the Apartheid museum which if like me you read most of what’s there. I spend most of the day there. Unfortunately you are restricted from taking photographs. At the moment there is a also a temporary display (which looks to be permanent) about Nelson Mandela. 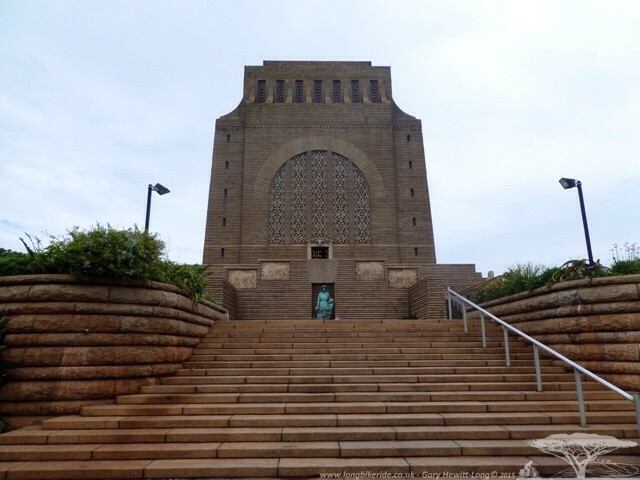 We visited the Voortrekker monument which lays in the southern part of Pretoria. The monument an impressive structure which commemorates the Voortrekkers who left the cape colony looking to settle elsewhere. 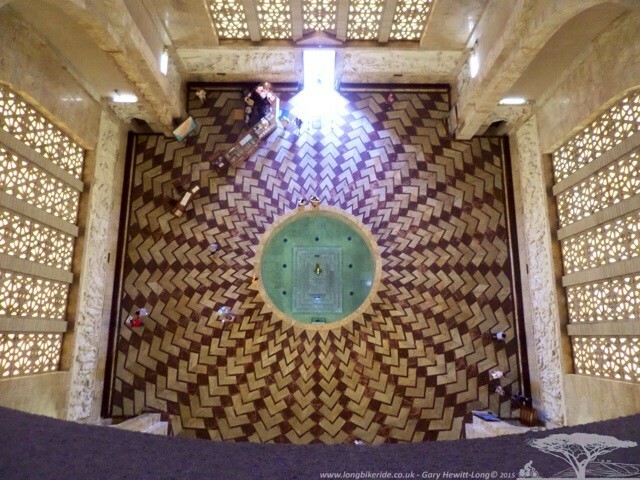 It’s possible to climb lots of stairs to the top of the monument. Its also possible to use what looks like a newly installed lift, which I only saw after climbing the stairs! Chris came up the lift.. 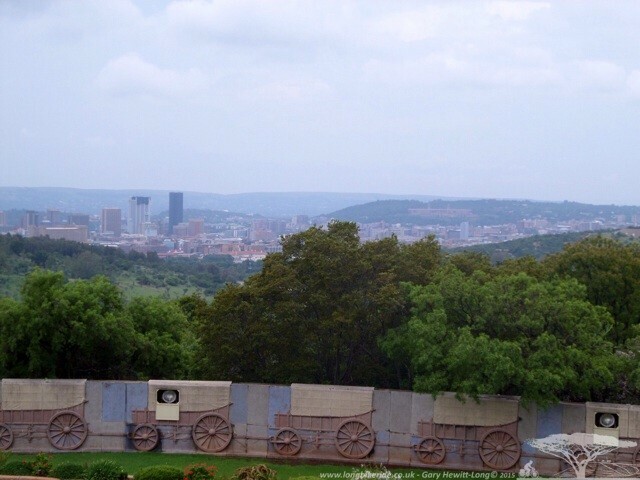 The views of Pretoria from the top of the Voortrekker monument are wonderful. 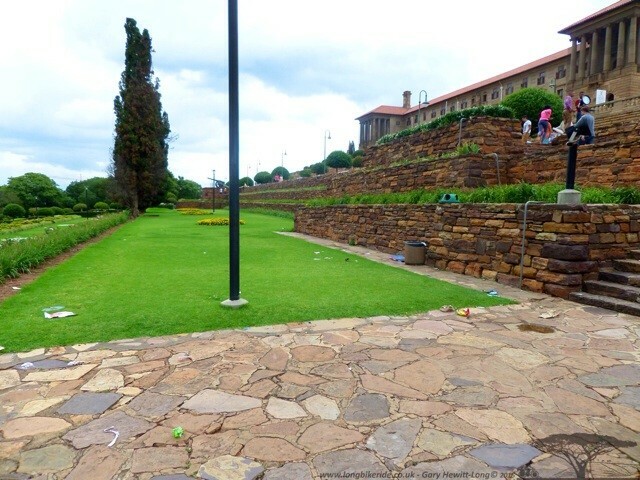 After the Voortrekker monument we headed into Pretoria, one of the three capitals of South Africa. 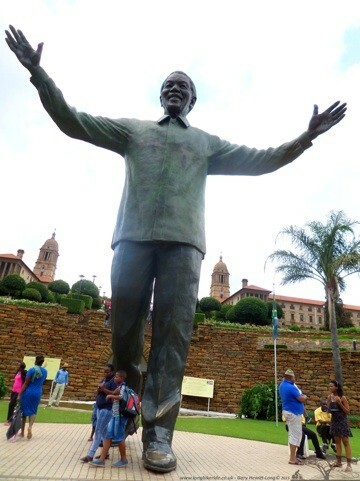 Pretoria the administrative capital and outside the Union Buildings, the official seat of the South African government is an impressive statue of Nelson Mandela. It’s a shame a lot of people didn’t use the many bins provided, litter was strewn everywhere spoiling a little what is a wonderful open space surrounded by stunning architecture. 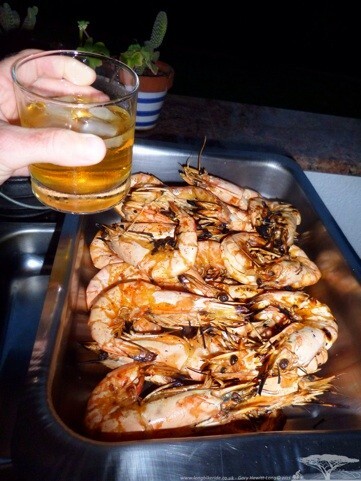 Chris and Brenda know how to cook, whilst staying with them we had some wonderful meals and some of the largest prawns I have ever seen, Mozambique Prawns. They go well with a Whiskey by the way. 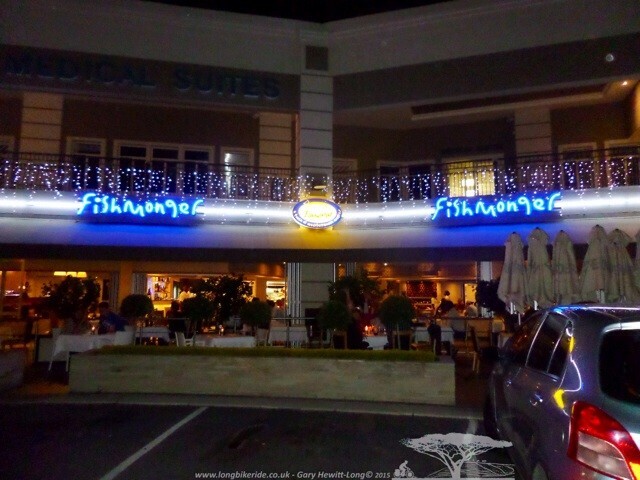 Johannesburg has some fine restaurants, visiting the Fishmonger for a meal with Chris, Brenda, Bev and Rob. I wasn’t so adventurous in the ordering, despite there being oysters and several fish dishes some of which I had not heard of nor tried before. I stuck to something plain that I knew, Hake in beer batter with chips. The fish on display impressive, well laid out. Luckily I managed to take a few photos before they were removed destined for someone’s plate. 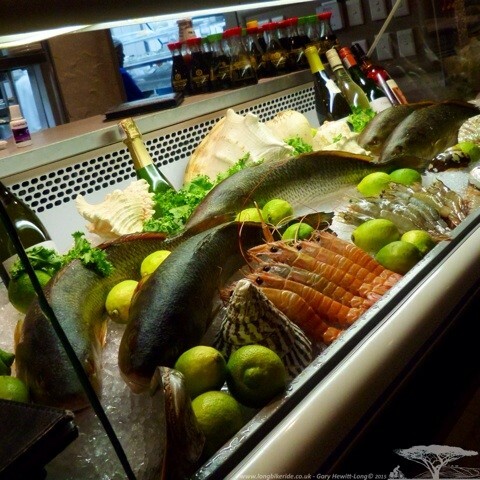 Food and Supermarkets now I am in South Africa are abundant compared to earlier in my trip. I don’t think I will be having any problems finding good food. One of the Pick ‘n’ Pay in Johannesburg being smarter and better stocked than Waitrose. The trolleys also go where you push them! Visiting a garden centre I spotted the below sign, which I don’t entirely agree with…. 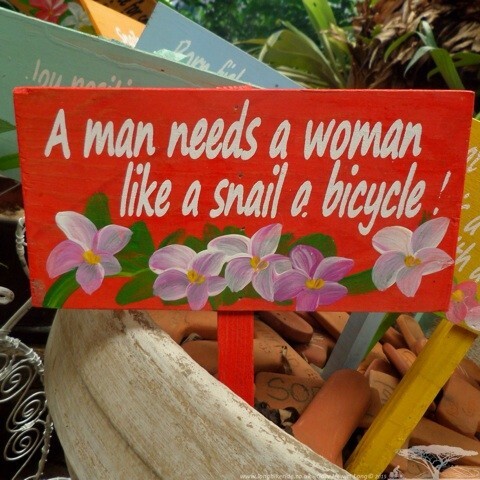 I am sure snails do really need bicycles, they’d be a lot quicker..
Snails could really do with a bicycle! Peter recommended that I have a drink in one of the oldest establishments in Johannesburg, the Radium Beer hall. Unfortunately the first time Chris and I tried to go the premises were shut for the Christmas period. The second time we went they were open. 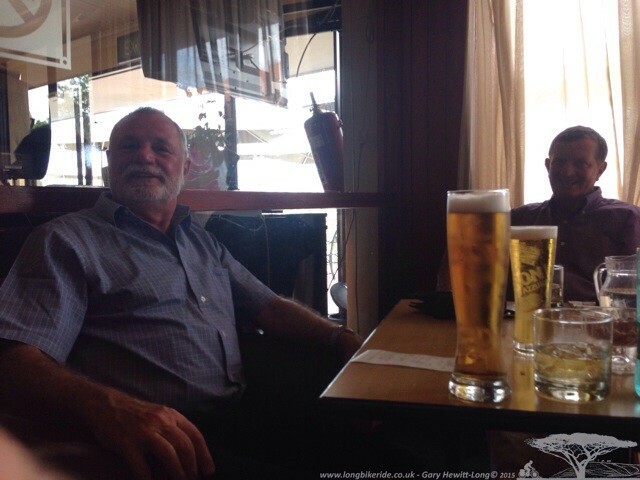 THe atmosphere is very similar to a UK pub, the staff and punters very friendly and the lager (no real ale) was very good. Miguel the owners son was interested in my trip and for a minute a two I became the topic of conversation, not always something I enjoy. A Big Thank You Chris and Brenda for making me so welcome in Johannesburg, I look forward to seeing you both in the DDC sometime.